I have finished the Roll and Read fluency practice sheets for Scott Foresman Reading Street Units 2-5 for first grade. I can’t wait to use these next year! “The Roll and Read sheets are leveled for differentiation: below level, on level, and above level. (These sentences come from the Monitor Progress section at the end of each week in the Teacher’s Manual.) Have students work with a partner. Partners take turn rolling a dice. Whatever number they roll is the sentence they must read. 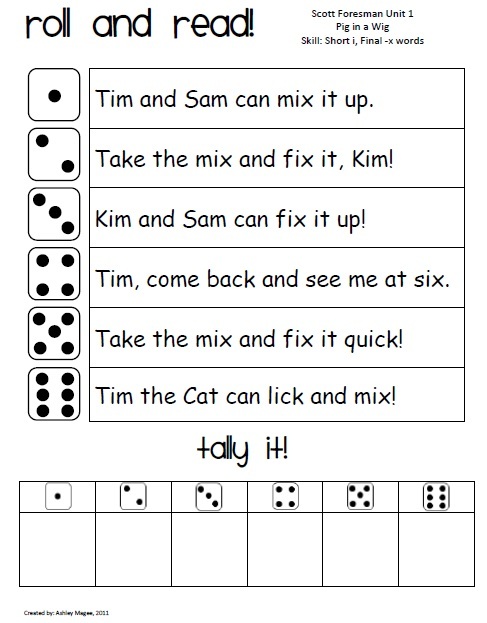 After reading it, the student paces a tally mark under the correct dice to tally how many times each sentence was read. Click below to purchase the roll and read sheets on Teachers Pay Teachers! That is a really great idea!! I am working on basal activities to accommodate Common Core Standards. But, your fluency activity is ingenious. Great for centers. I have another question for you about RS. How do you handle spelling tests? Do you follow the phonics progression of RS? Do you make up your own? I do follow the phonics sequence in RS. I use all of the same spelling words/bonus words. All of the students take the same spelling test on the same words each week. I use the same RS phonics skills each week, but I do not do the phonics/spelling lessons provided by RS. I usually make my own activities. Every now and then I will pull out a spelling worksheet if I need to or if I have a sub. This coming year I will also be adding in components of Sing, Spell, Read, and Write. What a fun way to mix reading fluency and math! I love the Roll and Read game for fluency practice. Would you be willing to share the blank template for Roll and Read? I would love to use it for spelling word sentences as well. I am also wondering if you would be willing to share the blank template? We don’t use a basal program. I am thinking this would be a great activity for fluency phrases and sight words. I am a new follower and am also interested in a blank template of the roll and read. We use Good Habits Great Readers, but I would love to incorporate this into our fluency routine if you are willing to share. Thanks for the consideration of this request! 😀 I would love to have a blank copy that I could use with my special education students!